35,000 feet is standard cruising altitude for a commercial jet airplane, but at those lofty heights the air temperature plummets below -51 degrees Celsius and ice can easily form on wings. To prevent ice formation and subsequent drag on the aircraft, current systems utilize the heat generated by burning fuel. But these high-temperature, fuel-dependent systems cannot be used on the proposed all-electric, temperature-sensitive materials of next-generation aircraft. 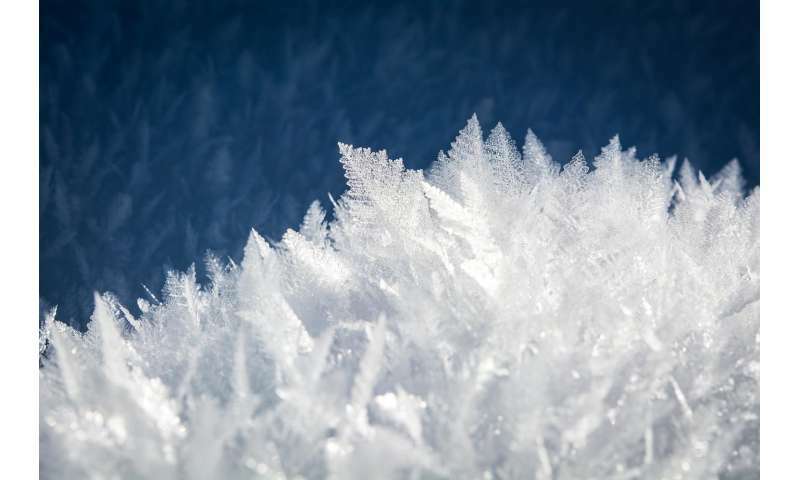 As scientists are searching for new anti-icing methods, physicists from Northwestern Polytechnical University in China and Iowa State University have taken a different approach. They've published evidence, in the journal Physics of Fluids, showing that equipment important in controlling landing and takeoff can double-up as icing control. "Current anti-icing methods are not suitable for next-generation aviation systems based on the new aviation technologies," said Xuanshi Meng an author on the paper. "We have found an excellent way to control the icing on these new aircraft." It depends on plasma actuators. Plasma actuators are a special type of short electrical circuit. When a high voltage is applied across the two electrodes, it causes the particles of air above it to ionize, forming a plasma, and inducing a flow, or wind. This plasma flow over the actuator has been previously manipulated to control the aerodynamics of aircraft wings, altering the lift and drag for landing and takeoff (known as flow control applications). But plasma actuators don't just release an induced wind. "When applying a high voltage, most is converted into heat and the rest is converted into an induced flow or ionic wind over the actuator, so the plasma actuator has both aerodynamic and heat effects," said Meng. "By coupling the aerodynamic and thermal aspects of the plasma actuator, we have provided a completely new method for efficient icing and flow control." The plasma control team of Northwestern Polytechnical University first realized the effect of plasma actuators on icing in 2012, when an ice cube placed in the discharge area of the plasma exciter quickly melted. To further demonstrate the mechanism of plasma ice protection, the team has designed incredibly thin, surface dielectric barrier discharge plasma actuators and mounted them on a 3-D-printed plastic NACA 0012 airfoil. Three configurations of actuators were installed in order to investigate how different aerodynamics impacted ice formation. Then high-speed cameras, alongside infrared thermal imaging and particle scattering lasers, were used to visualize how the induced flow and thermal output interacted. Tests were conducted in still air conditions as well as inside an icing wind tunnel, where cold particles of air were fired at the airfoil. The team found that thermal and flow dynamics are inextricably interlinked for all three actuators. The plasma actuators placed perpendicular to the airfoil surface were the most effective at transferring heat along the wing, completely preventing ice formation. By comparing heat transfer and flow between the different designs, the team concluded that the optimal design needs to generate as much heat locally, while also mixing well with the incoming airflow. "This could be used to design an effective anti-icing system at low enough temperatures to prevent stress on the composite material design of next-generation aircraft," said Meng. Meng's student, Afaq Ahmed Abbasi, added, "The conventional anti-icing technique uses air as hot as 200 degrees Celsius to vaporize the water droplets, and composite material cannot afford such high temperatures. But the plasma icing control can stop the supercool droplets forming ice on the surface of the vehicle without temperatures as high, which is good for the composite materials." Meng explained that his team's proposal to use plasma actuators as anti-icers was a "surprise" for fluid mechanics experts. Meng admits that they are just at the beginning of this research and that they still need to find out how thermal and flow effects are linked, and how exactly they work together to dissipate supercooled droplets from a wing's surface. Generally, at 35,000 feet and at an air temperature of -51 degrees Celsius there is no water in liquid form in the atmosphere that could freeze to ice upon contact with the wings of an aircraft. Also, I don't think that the way of working of an icing wind tunnel is that "cold particles of air were fired at the airfoil."